Sideritis – a Greek white wine producing grape variety from Peloponnese. Sideritis is a Greek white wine producing grape variety. It is grown in the north Peloponnese region close to Patra. It is also grown in the Aegean Islands and also in some parts of Central Greek. It is very rare to find a varietal wine out of this variety of white wine producing grape. Only one producer has made such wine. It is Parparoussis. It is often blended with Roditis to produce a large number of white wines. It is because of the acid and zing it puts in the wine it is blended in. Usually, the wines made from Sideritis are spicy as well as crispy. It is known by some other names in many regions. These include Akaki, Chimoniatiko, Sidezites and Sideiritis. Sideritis wines are distilled and aged for up to 12 years in oak casks by Parparoussis. This is among the wines which are very costly and rare to find as they are produced in a very limited quantity. Only Parparoussis is the producer who is experimenting on this variety of grape to give it new blends and add its flavours to many white wines. The alcoholic content of the wine is not very high, but the acidic content is high enough to be cherished by almost all wine tasters who prefer wines with high acidity. Also the grape adds very unique taste of natural minerals which enhances the taste of almost all wines it is used in. the grape production has not experienced and fall in production rather, a little hike was noticed when the grape proved to age well as well as provide such crispiness and acidity. The name Sideritis is derived from a Greek word Sidero which means iron. This name was given to the grape on the basis of its mineral qualities. Its home vineyard was in Bozaitika. The exact origin of the Sideritis grape is not known like most of the wine producing grapes. It has been growing in these areas for a long time. There has not been an increase or decrease in the production and therefore it is assumed that it will continue to be used in blending of white wines to give them high acidity as well as mineral tastes. There is no evidence which can help us to trace back from where the grape actually originated and how it was decided to use the grape in the blending of such large number of white wines. Also, the grape has no genitally similar quality and is one of its kinds. Sideritis grapes have a pinkish skin. The varietal wine made from the grape gives out citrus and grapefruit flavours. It also shows very pleasant notes of minerals. The berries of Sideritis grape variety ripen in late season. They take up their pinkish colour in the autumn-winter. The wines made have a low alcohol content, high acidic content and touch of spice in its taste. It grows best in alluvial sandy soil. The berries of the grape are very small in size and bunches are compact and not very large. The colour of the wine is a kind of medium-dark amber. The flavours are rich and give a smoky finish. The wine can be enjoyed with almost all food items. If kept properly, the wines age very well and can last up to 12 years with some distillation process. More and more experiments are now being done to extract the maximum out of this grape variety and use to produce wines of unique tastes. Wines made from Sideritis grape can be enjoyed best with smoked potatoes and baked tomatoes. The wine has a high acidic content due to which it can be taken with salted dishes. People enjoy this wine with slated vegetables and peanuts. You can also consume it with sushi. The taste of wine is complemented by cheese balls. The grape is different from most of the other varieties of white wine producing grapes. The taste is also somewhat unique and pleasing. The varietal wine made is aged for a long time and so the taste of the wine is enhanced. 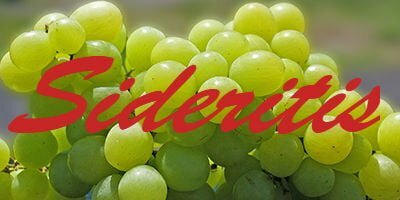 You must try the taste once to enjoy the mineral taste and acidity of the Sideritis grape!